Quasi Universal Intergalactic Denomination or QUID is the first currency of its kind in the universe. The QuasiUniversal Intergalactic Denomination, or QUID, is the new currency ofinter-planetary travelers. It was designed for the foreign exchange companyTravelex by scientists from Britain's National Space Centre and the University of Leicester. The design intent is that QUIDs must withstand the rigors ofspace travel – no sharp edges and no chemicals that could hurt space tourists. "Noneof the existing payment systems we use on earth – like cash, credit or debitcards – could be used in space," said Professor George Fraser from the University of Leicester. "Anything with sharp edges, like coins, would be a risk toastronauts while the chips and magnetic strips used in our cards on Earth wouldbe damaged beyond repair by cosmic radiation." The rounded edges of the QUID make it safer, and alsoencompass the eight planets orbiting a sun which are part of the design. 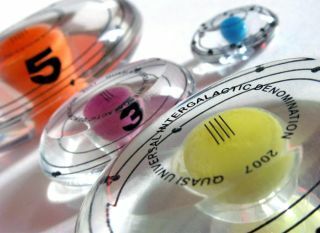 Eachof the orbiting planets contain a serial number; taken together, these numberswill give each QUID disc a unique code to prevent counterfeiting. What's a QUID worth? The current exchange rate for the newcurrency is £6.25 to the QUID (or US$12.50 or about 8.68 Euros). Hopefully, as we travel further from Earth and spreadthroughout the galaxy, people will not confuse the QUID with the"quid" – a slang term for the British pound sterling, possiblyderiving from the location of the Royal mint at Quidhampton, Wiltshire, England. "Authority pays the same for ice now as thirty yearsago. And that's not okay. Worse yet, Authority scrip doesn't buy what it usedto. I remember when Hong Kong Luna dollars swapped even for Authority dollars.Now it takes three Authority dollars to match one HKL dollar..."
"...Mr. Icholtz brought out his wallet and begancounting out skins. 'Very little publicity will be attached to this at first.But eventually--' He offered Hnatt the stack of brown, wrinkled, truffle-skinswhich served as tender in the Sol system..."
Readers are encouraged to contributemore examples. Via TravelexLaunches QUIDs in Space.